In the grand scheme of things in the world of college football, it is almost mind-boggling how much turnover there is in the coaching profession. This phenomenon is no different with the Wisconsin football team this year as former head coach Bret Bielema departed to Arkansas, taking a plethora of coaches with him. This opened the door for Gary Andersen and his new staff―save Ben Strickland and Thomas Hammock―to take the reins of a program that has won an unheralded three-straight Big Ten titles. While there is plenty regarding the backgrounds of the new positional coaches, I dive further into their history that will help gauge their chances for success for the red and white. Here's a look at the coaches on the defensive side of the ball. Background: Aranda has been a fixture in college football for quite some time but what should be somewhat alarming to Badgers fans is the fact that this is his third job in three years. Despite that, he believes it helps him become a better coach. “You pick up things from different coaches and you pick up things from the players..so I think experience helps,” he said during his introductory press conference with the media. Wisconsin is a marquee program that should attract coaches like Aranda. However, he did have two lucrative job offers with strong ties where he might have been more comfortable. According to Avinash Kunnath of Pacific Takes, Aranda was a finalist for the Cal job before former UW linebackers coach Andy Buh accepted the position (oh, the irony!). He had strong ties with new Cal coach Sonny Dykes as they were both at Texas Tech when Aranda was a graduate assistant. Furthermore, Aranda was born in California, attended Cal Lutheran and is generally known as a California guy. Speaking of Texas Tech, he was reportedly a finalist for the DC job as well. Though he did not have any direct ties with new TTU head coach Kliff Kingsbury, he earned his Master's Degree from Tech and was a grad assistant there, as previously mentioned. While it is a minor tie, I'm still surprised he did not pursue the position. Style of play: His style of play is the factor that will be the most monumental in his transition to the Wisconsin sidelines. UW has traditionally played a 4-3 defense. Under Aranda, they will switch to a 3-4. Aranda alluded in his press conference that a center piece of his defense will be flexibility. Additionally, blitzing is and will be a big part of his philosophy, which will include being creative on third downs (similar to what UW did last year) and attacking protections with four guys―a scheme he instilled at Utah State. This tactic should bode well for Wisconsin as opposing offenses will not know which four down lineman will be rushing. In regards to the secondary, he is going to primarily stick with the same principles that were utilized last year at UW, as the unit will mix in quarters defense as well as Cover 1. “Do what you do best,” he said about his future defensive schemes. While outsiders may worry about the current players adapting to a new defensive scheme, Aranda stressed the key will be the fourth guy upfront. Also, though it will be disguised as a 3-4, it will still be a four-down structure. Regardless of what he is disguised as, he still needs playmakers to rush off the edge. The best candidates for that would be linebacker Chris Borland and defensive end David Gilbert. I think Aranda could have a field day with both of these players, especially Gilbert due to his athleticism. It will be very interesting who will be in the mix next year at the linebacker position. Obviously, the unit is returning Ethan Armstrong and Borland but the key will be Mike Taylor's replacement. Derek Landisch has seen playing time, though mostly on special teams, and his height is a bit of red flag. Also, will Vince Biegel see the field? We shall see. 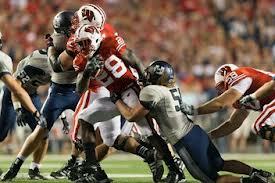 Aranda's defense held All-American Montee Ball to only 3.8 yards per carry on Sept 15, 2012. Noteworthy statistics: Starting in 2007, Aranda was a defensive coordinator at D-II Delta State, where he was instrumental in the program's Gulf South Conference championship. They led the nation in pass efficiency defense, ranked second in total and scoring defense and third in run defense. He then jumped ship to the D-I level, where he was a defensive line coach at Hawaii before being named the defensive coordinator in 2010. While people love statistics―as do I―it is important to keep them in perspective. For instance, in 2009 (before he took over as Hawaii's DC), their defense was lackluster at best. They gave up 29.5 points/game and 404.5 yards/game. Also, they gave up a total of 2,635 yards through the air and almost as many on the ground (2624 yards). Finally, the unit collected 12 interceptions. When you compare those statistics to when he took over as DC, they are absurd. The unit improved dramatically during the 2010 season, as they gave up 22.7 points/game and 344.2 yards/game. They allowed more yards through the air (2761 total yards) but cut down significantly on the yards allowed on the ground, as the unit gave up 1714 total yards. The largest improvement seen was in the secondary as they intercepted 23 passes and returned three for touchdowns. During the 2011 season (before he took over as Utah State's DC), their defense allowed a whopping 28.3 points/game and 368 yards/game. They also allowed 3184 total pass yards and 1536 total rush yards with only four interceptions. Once again, his presence on the sidelines made a significant impact across the board. During the 2012 season as DC, the defense gave up only 15.4 points/game with 322.7 yards/game. The secondary allowed 2535 total pass yards while the defensive line only allowed 1337 yards on the ground. If this trend is any indication of future Badger defenses, the unit will be in great shape. Notable players coached: In 2008 at Hawaii, he coached a unit that included David Veikune, Joshua Leonard and WAC second-team selection Keala Watson. Veikune was taken in the second round of the 2009 NFL Draft by the Cleveland Browns while Leonard signed as a free agent with the Houston Texans. Also, during his time at Texas Tech, he coached Aaron Hunt―the Big 12's all-time sack leader. Recruiting emphasis: For the 2013 recruiting class, Aranda reaffirmed the commitments of Garrett Dooley (LB, 3-star, 6'2'' 215 lbs; Rochester, Illinois), Leon Jacobs (LB, 2-star, 6'4'' 220 lbs; Santa Claita, California) and Donnell Vercher (DB, 3-star, 6'2'' 200 lbs; Fresno, California). Also, while Aranda did not directly recruit Brookfield East product and defensive end Alec James, he is a guy to keep an eye out to see early playing time. The most beneficial aspect where Aranda can help is in recruiting as he plans to expand more to the west. He mentioned in his press conference a possibility of reaching out to the state of Hawaii and he seems to already have strong ties in the state of California. It hasn't been determined what recruiting area Aranda will be responsible for moving forward but expect him to secure future commitments out west, as he did with Jacobs and Vercher. Impression: Overall, this is a guy with a proven track record and the comparative statistics should have UW fans extremely anxious to see where Aranda can take this defense. Do I believe he can take this unit to the next level? Absolutely, without a doubt. Once he gets his own personnel in the system that can adapt to his 3-4 style of play, it should be even more revealing how good the defense can become under Aranda. However, my only cause for concern is regarding his longevity. I know coaches move around quite frequently but what if a more lucrative job offer comes knocking? He is getting paid a substantial amount with a salary of up to $480,000/year, which is fairly competitive. He seems excited to finally be at a top-tier program and hopefully that speaks for itself in regards to his longevity at Wisconsin. Posted in Coaching Profiles and tagged with Dave Aranda, Gary Andersen. February 19, 2013 by Buckaround.